"Easy and delicious! 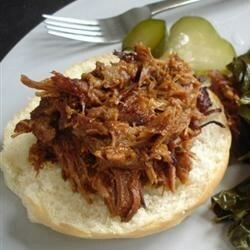 Pork shoulder, slow-cooked or simmered on the stovetop with onion and spices. Serve hot in sandwich buns." Cut boneless pork shoulder crosswise into 1/4 inch slices. Partially freezing it will make slicing easier. In the slow cooker, combine sliced pork, onion, garlic, brown sugar, dry mustard, salt, pepper, ketchup, and Worcestershire sauce; mix well, and cover. Cook on Low, stirring occasionally, for 6 to 8 hours or until the meat is tender. OR : In a Dutch oven or large saucepan, combine pork, onion, garlic, brown sugar, dry mustard, salt, pepper, ketchup, and Worcestershire sauce; mix well. Bring to a boil, reduce heat, and cover. Simmer, stirring occasionally, for 2 1/2 to 3 hours or until pork is tender. This was pretty good. I used boneless, skinless chicken breasts. Not sure if I'll make it again. Taste was ordinary.